The “history” of Congregation Etz Chaim (Tree of Life) began recently. In the summer of 2004, fifteen families in Bentonville organized the town’s first Jewish congregation. Soon after, their ranks grew to thirty-five families. The Jewish population has continued to increase because of the presence of the corporate headquarters for Wal-Mart; not only does Wal-Mart attract Jewish executives, but its supplier companies maintain nearby offices as well. Initially, Jews in Bentonville were involved with the Jewish congregation in nearby Fayetteville. They even talked about building a synagogue halfway between the two towns. But, as their numbers increased, Bentonville Jews realized that they could support their own congregation. Most members are relatively new transplants to the area. Initially, they held services in a room at the Bentonville Boy’s and Girl’s Club. They held their religious school in a conference room at the Bentonville Advertising and Promotion Commission. In 2005, they bought a former Assembly of God church and made it into a synagogue, holding their first services in the building on May 20. On September 16, 2005, they held a dedication ceremony for their new synagogue, which featured representatives from the local Baptist, Catholic, Islamic, and Hindu communities. 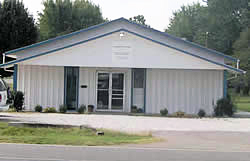 Etz Chaim has benefited from other small town congregations in Arkansas. 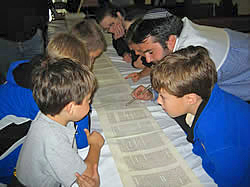 Congregation Beth Israel in El Dorado, Arkansas, which is now down to only a small number of adults, decided to donate one of their torahs to the fledgling congregation in Bentonville. They also received various artifacts from Temple Beth El in Helena after it closed in 2006. Etz Chaim accommodates members of different Jewish backgrounds and practices, and has yet to affiliate with a national movement. They currently have a visiting rabbi who comes once a month. They have an active sisterhood and men’s group. Since most members consist of young families with kids, Etz Chaim has the second largest Jewish religious school in Arkansas, with thirty students. This nascent congregation has a bright future, although a high turnover rate in the local Jewish population has been a challenge.